Marnie Sullivan, Ph.D., and Michael Mongera, junior Communication major, unveil Lumen on April 19. 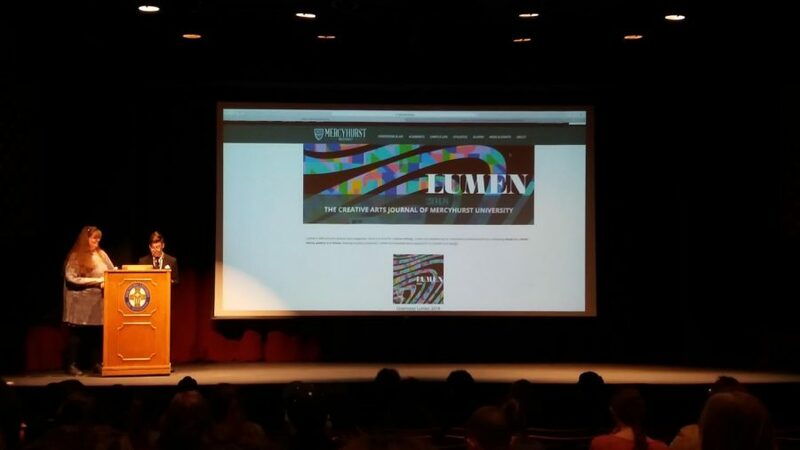 Lumen, Mercyhurst University’s student literary and fine arts magazine, was released at a ceremony in the Taylor Little Theatre on April 19. Awards were given out to students who wrote the best pieces of fiction and to the student who wrote the best essay on literature. Lumen is an almost entirely student-run fine arts magazine. Students submit their creative works, which are then curated and edited by students. The creation of the magazine itself is handled by the Graphic Design department. 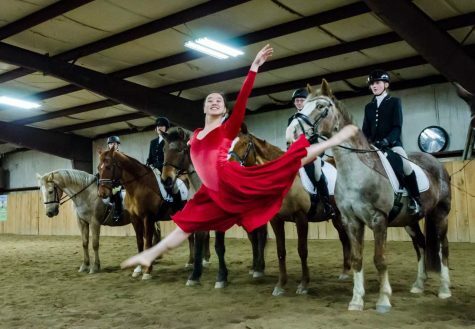 The unveiling, which took place at 8 p.m. in the Taylor Little Theatre, opened with a short showcase from the Dance department. The showcase was a video presentation of Lucas De Marinis’ performance “Sui Generis,” which is included in the digital version of this year’s Lumen. Marnie Sullivan, assistant professor of English, opened the ceremony by introducing Lumen. Sullivan honored Kenneth Schiff, Ph.D., who passed away last May. “The literary arts have a long history of publication at Mercyhurst University, but it was the venerable Schiff who brought the Lumen back to life,” Sullivan said. “I would like to think of Schiff here tonight, smiling down on us and nodding us forward in our celebration of the arts, and our celebration of the spirit of the arts,” she said. The unveiling also featured the annual P. Barry McAndrew Writing Awards for the best three pieces of creative writing in this year’s edition of Lumen as well as an additional award for the best literary essay written by an undergrad. The winners received monetary prizes as well as plaques. The awards ceremony was followed by an open mic session, where students read their own creative writing. Readers included Harper Ratliff, Logan Floyd and Abigail Stevens. The academic advisers for this year’s Lumen were Sullivan; Gregory Brown, Ph.D.; and Jodi Staniunas Hopper, chair of the Art department. The editors-in-chief were Jacob Leach and Michael Mongera. The editors were Carlena Bressanelli, Ben Kolbrich, Catherine Messina, Anthony Miller, Melissa Nahra, Abby Stevens, Tereza Pintur, Rebekah Prather, Harper Ratliff, Alicia Rogers, Emily Rossi, Elizabeth Shewan and Allison Schweiger. 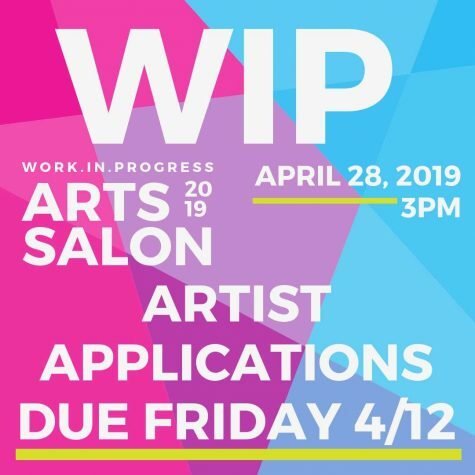 The designers for this year’s Lumen were Erin Glass and Sara Hood. Physical editions of the Lumen were handed out before the awards ceremony. Unlike previous years, nothing submitted to the Lumen was relegated to the digital version due to space. Every piece accepted into the Lumen can be found in the physical copy. Digital editions of this year’s edition of the Lumen, as well as the 2016 and 2017 editions, can be found at www.mercyhurst.edu/lumen.